Today we're debuting the gorgeous Merry and Bright Collection! Instructions: Card size is 5 x 7”. Cut white cardstock 10 x 7”, score and fold at 5” on the long side. Cut two pieces of paper from the Merry and Bright Collection 4 7/8 x 6 7/8”, ink the edges with Forget-Me-Not ink and adhere one piece to the inside of the card and one piece to the card front. Cut paper from the collection to fit the 5 x 5” shadowbox front, top, bottom, sides and inside back of the shadow box. You will need 2 pieces 4 7/8 x 4 7/8” and 4 strips measuring 4 7/8 x 7/16” each. Use the die from the Cut Mat Create 2A Die to cut the opening in the front. Ink all the edges with Forget-Me-Not Ink. Adhere all of the paper to the shadow box using dries clear adhesive and assemble the shadow box. Die cut the Decorative Medallion from white cardstock twice, adhere the two together, sponge with dries clear and cover with Rajni’s Crystal Clear. When dry, adhere to the back of the shadow box as shown. Cut two tags from the paper collection using the Luggage and Tags die, cut a mat layer from the same paper used to cut the circle, ink the edges, add a piece of ribbon and adhere to the card base as shown. Adhere the shadow box to left side of the card. 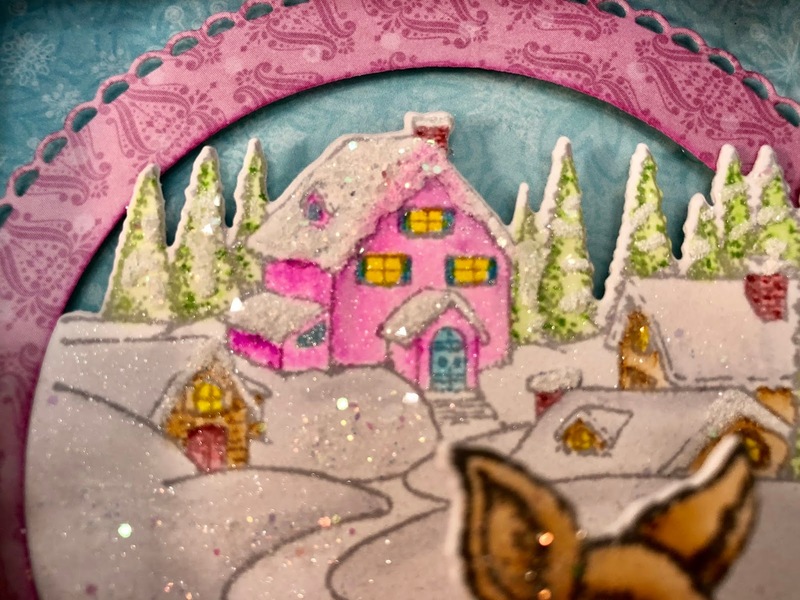 Stamp the snow scene on white cardstock using Archival Shadow Gray, color using the Zig markers, spray with Sheer Shimmer Spritz Sparkle, add dries white adhesive to the trees and rooftops and sprinkle with Rajni Chawla’s Crystal Clear. Lightly sponge areas of the snow with dries clear adhesive and sprinkle with Crystal Clear and diecut with the coordinating die. Diecut two more times from white cardstock and adhere together. Cut the circle frame from designer paper using the Circle dies. 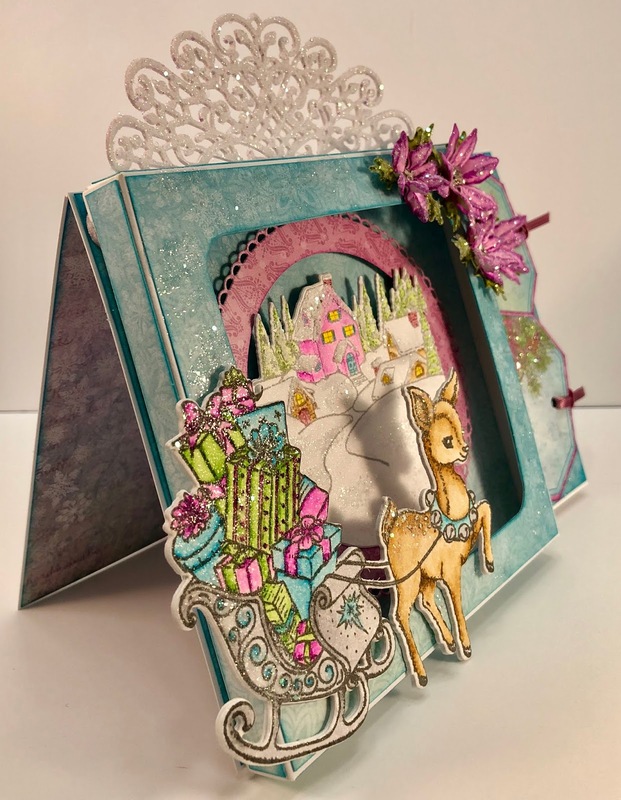 Adhere the snow scene and the frame to the inside of the shadow box using dimensional dots. 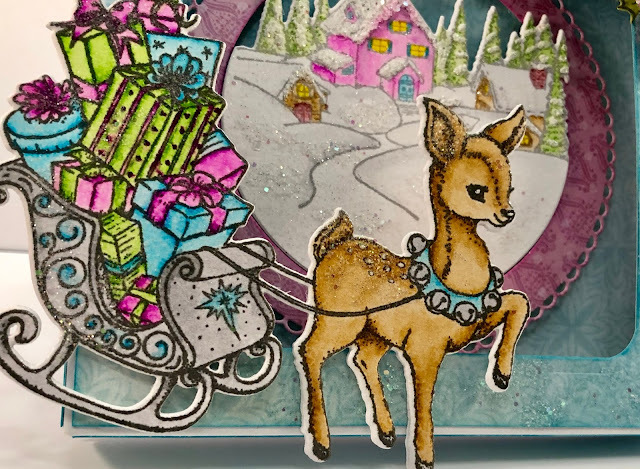 Stamp the sleigh and reindeer with Archival Watering Can, color with the Zig markers, spray with the Shimmer Spritz and let dry. Randomly sponge with dries clear adhesive and sprinkle with glitter. Adhere to the shadow box as shown using dries clear adhesive. 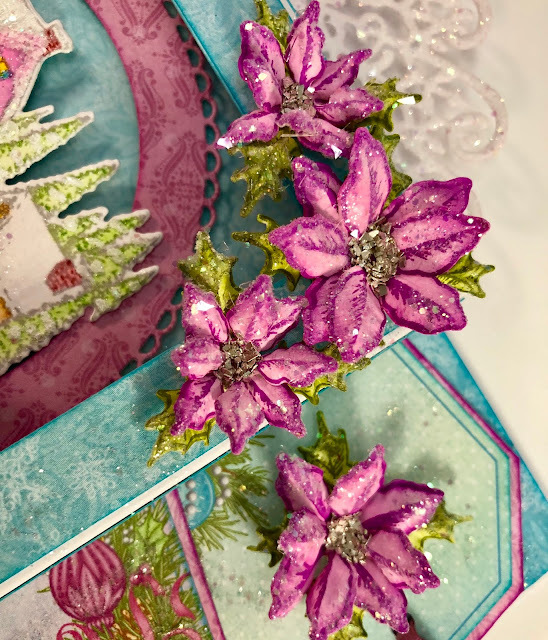 Stamp the poinsettias on white cardstock using Cactus Flower ink, color with Magenta Hue ink and diecut using the coordinating dies. Stamp the Holly leaves on white cardstock using Fern Green ink, color with Leaf Green and diecut using coordinating dies. Place the flowers and leaves face down in the 3D Mold, spritz with water and run through the die cutting machine to shape. Ink the edges, adhere two petals together to create one flower, adhere to holly leaves, sponge with dries clear adhesive and sprinkle with Crystal Clear. Add glue to the flower centers and sprinkle with silver glass shards. Adhere poinsettias to card as shown using a hot glue gun. Lightly sponge the card with dries clear adhesive and sprinkle with glitter. 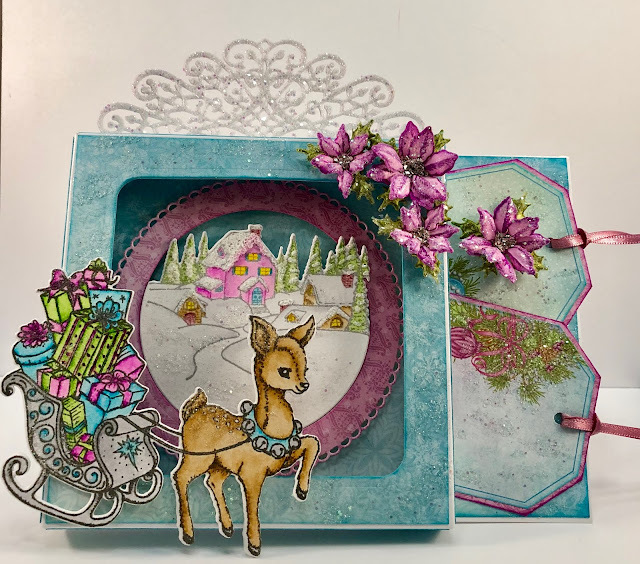 Be sure to stop by the Heartfelt Creations blog to see all of the gorgeous projects created by the fantastic Design Team. Beautiful card with the shadow box Janet! I love the tags on the side and all the beautiful details of your shadow box scene!!! Gorgeous shadow box card Janet. Your colouring is just stunning and the tags finish it off! Such a beautiful shadow box card! Love your wonderful coloring and sparkle!